Pakistan is failing to address thousands of human rights abuses taking place in its tribal areas in the north-west, Amnesty International has said. 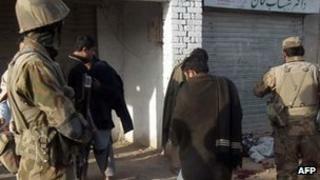 In a new report, the campaigning rights group says people are being terrorised by both the Taliban and the military. It claims that abuses are allowed to take place with impunity as constitutional safeguards do not apply. The Pakistani military has emphatically rejected the report, which it has described as "a pack of lies". An army spokesman told the BBC that the report was "biased and sinister propaganda" against Pakistan's armed forces, based on fabricated stories to serve an agenda. There has been no response to Amnesty's claims from the Taliban. The report says that militants have been driven out from some of the tribal areas but these districts are not yet fully secure. "After a decade of violence, strife and conflict, tribal communities are still being subjected to attack, abduction and intimidation, rather than being protected," said Amnesty's Polly Truscott. The report, entitled The Hands of Cruelty, describes how what it calls the region's "legal wilderness" is fuelling a human rights crisis. It details cases where men and boys have been arbitrarily detained by armed forces for long periods with little or no access to due process or proper safeguards, as well as documenting multiple cases of deaths in custody. Many of those detained have made allegations of torture, claims which have rarely investigated, it says. Amnesty says that, because constitutional safeguards are not applicable to the tribal areas, armed forces are using broad new security laws to commit violations with impunity. "By enabling the armed forces to commit abuses unchecked, the Pakistani authorities have given them free rein to carry out torture and enforced disappearance," Ms Truscott said. Locals describe living in fear of being tortured and killed by the Taliban if they are accused of being a spy, or of being picked up by the army who accuse them of links to militants. An army spokesperson previously told the BBC that deaths in custody are one-off incidents. Some argue the military needs sweeping powers to deal with terrorism on the border with Afghanistan. Amnesty is urging the Pakistani government to reform the legal system in the tribal areas which, it says, is perpetuating the cycle of violence.